On Sunday morning, a joint team of the J&K Police, the Army and paramilitary forces cordoned off Badigam village in Shopian based on inputs about the presence of four top Hizbul Mujahideen commanders and the assistant professor who had joined the militants only 36 hours ago. Five Hizbul Mujahideen militants, including an assistant professor at Kashmir University, were killed on Sunday in an encounter in Shopian district. As protesters clashed with the forces near the encounter site and later across south Kashmir, five civilians were killed and over a hundred were injured. Many of them had pellet injuries in their eyes, said doctors who attended to them in Shopian and Srinagar. With the militants rejecting police’s call to surrender, a gun fight followed that lasted several hours. All five militants – Hizb commanders Saddam Padder, Bilal Mohand, Adil Malik and Tauseef Sheikh and Kashmir University assistant professor Mohammad Rafi Bhat – were killed and an Army personnel and a policeman injured. Padder, one of the only two surviving militants in the Burhan Wani picture that went viral in 2015, was Hizb’s district commander for Shopian and had escaped from security cordons several times in the past. Saddam, police sources say, was active in his village Heff-Shirmal and nearby areas. 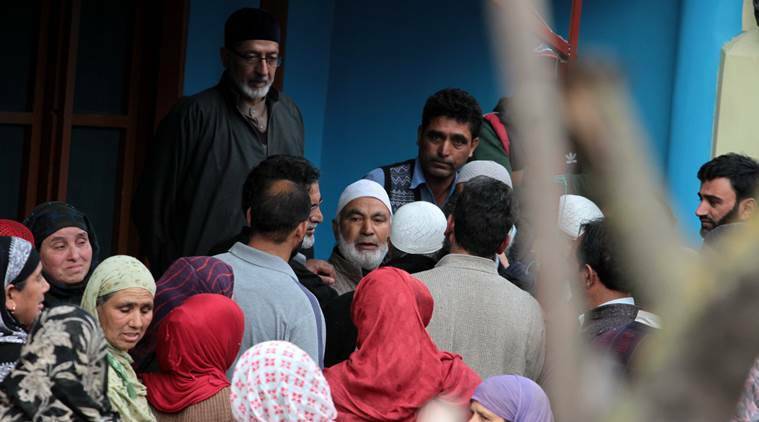 Mohand and Malik also operated in Shopian and commanded areas around their native villages, said police. Sheikh, a resident of Kulgam, was a wanted militant commander. 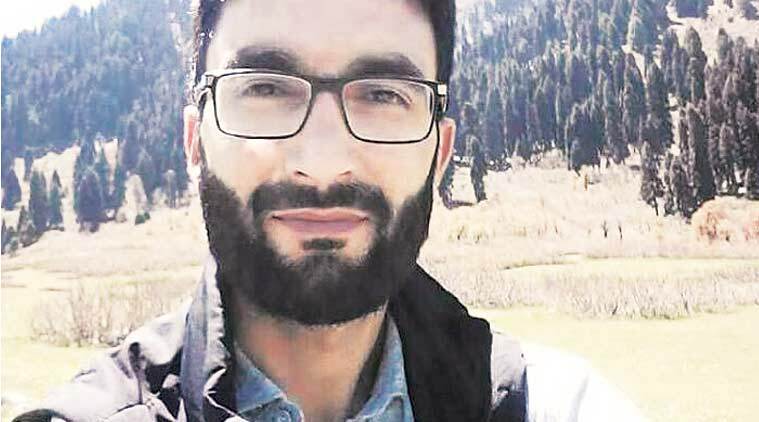 One of his uncles, Abass Sheikh, is a top Hizbul Mujahideen commander and two other uncles, who had joined militant ranks, had been killed in the past. The encounter and the subsequent killing of the militant commanders triggered massive protests across south Kashmir. Five civilians were killed and over a hundred were injured when they clashed with police, army and paramilitary forces in several parts of south Kashmir. The protesters also set on fire two vehicles of the Fire & Emergency Services in Shopian. Doctors at Shri Maharaja Hari Singh (SMHS) Hospital in Srinagar said they had received around 40 injured people at the hospital today. “Most of them were referred from south Kashmir. Thirteen of them were hit by bullets and the rest by pellets,” Casualty Medical Officer of SMHS Hospital in Srinagar said. A doctor in the ophthalmology ward of the hospital said 16 boys had been hit by pellets in their eyes. Separatist organisations have called for a shutdown on Monday across Kashmir Valley and asked people to organise a sit-in outside Srinagar’s Civil Secretariat when it reopens on Monday after the government’s Durbar move from Jammu to Srinagar. 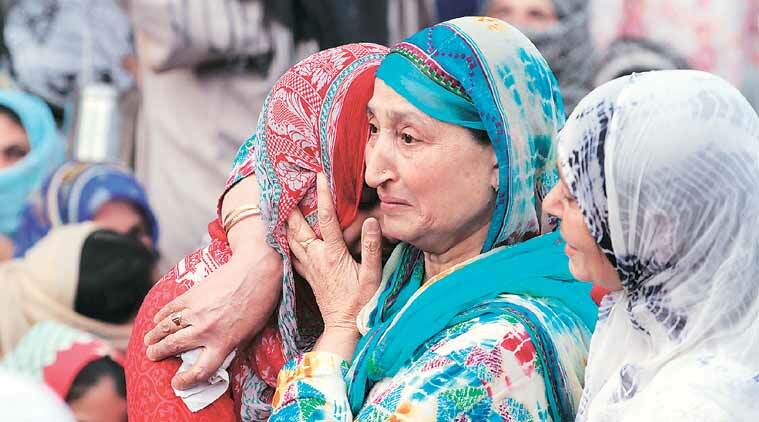 On Sunday evening, as the militants were buried in Shopian and Kulgam, thousands of people attended their funerals and militants turned up to offer gun salutes.